In 1969, the Chief Scientist at Xerox – then a rich and famous photocopier company – suggested that they ought to invest in a second research center away from headquarters. They chose Palo Alto and created Xerox Parc. In the next decade, the scientists at Xerox Parc incubated, among other things, the first graphical user interface controlled by a mouse, graphics display, and text editor. Of course, Xerox never ended up commercializing any of this as their executives never saw the potential of these inventions. So, many of the best researchers left to places like Apple Computer and ended up inventing the future. Xerox Parc was a one off in many ways. It was and will likely remain among the most productive research facilities in the history of mankind (Bell Labs, perhaps, would be its only real competition). But, the retelling of this famous story doesn’t fail to inspire humility. The executives at Xerox weren’t stupid – they were just not incentivized to recognize the potential of these breakthrough ideas. That could easily be you or me. It also never fails to remind me of the importance of investing a small but consistent portion of resources – be it at work, in our financial investments, or in life – in research/exploratory projects with no immediate pay off. Many of these don’t seem to pay off for the longest time. 1. I missed 3 use cases – i) Waze/maps when we were driving, ii) Ability to call contact other when we split ways at a crowded area, and iii) Whatsapp to send the occasional message to framily. 2. I did not miss the following – i) Checking if there’s any new email or message because the phone is close by and ii) Reading articles on my phone – I prefer a larger screen but the phone is really convenient. Overall, I can’t say I missed the phone all that much. I did cheat a bit by sending some messages from my wife’s phone too coordinate with friends – but, it was minimal. I enjoyed doing all my writing and reading from a larger screen – it was more targeted and intentional than reflexively picking up my phone. 3. I’ve been disconnecting from work email for a full 48 hours between Friday evening – Sunday evening for a few months now. And, while that has enabled me to be better engaged through the weekend, there was something wonderfully liberating about switching off completely. We normally associate detoxing with the body. But, there’s something to be said for detoxing for the mind. I look forward to doing this more. Was the invention of the axe a good thing or a bad thing? The axe was among the first simple machines — a breakthrough in technology that propelled humanity forward. It helped our ancestors chop wood and hunt. But, it was also used as a weapon in war. Every incredible advance has had a dark side. We have prevented infant mortality thanks to advances in ultrasound technology. And, yet, the same technology was responsible for female infanticide. Industrial farming has helped us feed billions of humans with fewer humans involved in agriculture than ever before. However, it has also resulted in routine horrible treatment of farm animals. Given this context, it is often amusing to see the discussion around artificial intelligence. We see talk of doomsday one day (“all the jobs are going away”) and techno-optimism on another (“AI is going to help us by freeing us from repetitive tasks”). Of late, I’ve been seeing more media devoted to the latter. It is worth examining both sides of the conversation. Not doomsday. The central hypothesis behind the idea that there is no doomsday on the cards is the idea that we’re moving into a world with IA or “Intelligence Augmentation.” The idea here is that AI is great at finding answers. But, it is on us to find questions. We’ll find new and interesting questions to keep us occupied while AI helps us eliminate repetitive tasks and make us more efficient. And, we’ll use ingenuity to create new jobs that don’t exist — just as we created “Yoga instructor” or “Zumba instructor” jobs after the industrial revolution. One example of this is a painting robot that was featured on Wired (see video — 4 mins) that increased the productivity of human laborers by 4x while taking over all the repetitive tasks. You’ve probably come across similar stories. The surge in recent positivity is also thanks to an OECD research report that classified ~10% of American jobs as high risk. This is much lower than previous forecasts that labelled ~50% of jobs as high risk. Walmart executives have sketched a picture of the company’s future that features more self-checkouts and a grocery-delivery business — soon escalating to 100 cities from a pilot program in six cities. Personal shoppers will fill plastic totes with avocados and paper towels from Walmart store shelves, and hand off packages to crowdsourced drivers idling in the parking lot. Assembly will be outsourced, too: Workers on Handy, an online marketplace for home services, will mount televisions and assemble furniture. Such examples are also dime-a-dozen these days. More automation promises more returns to shareholders => happier executives and boards. Of course, it is also easy to counter all examples of optimism. For example, the same painting robot (featured above) that increased productivity of human laborers by 4x is a great place to start. At some point — assuming other painting firms invested in robots — we will have 4x the amount of painting capacity at hand. Are there as many jobs to go around? This Economic graph summarizing some of the findings was particularly interesting. Notice how the percentage of jobs at risk of automation decreases as a country gets richer? The polarization that the report warns may not be limited to high skill and low skill jobs then. There is reason to believe that we might see a growing schism between richer and poorer countries. The truth likely lies somewhere in the middle. All this brings us back to the story of the axe. Every technology breakthrough has a dark side. The challenge, then, is to not get caught in all the techno-optimism that accompanies the emergence of breakthrough technology and to take the effort to think through the second and third order consequences. As we’ve seen in the revelations about the effects of social media in the past 2 years, the absence of such thought can have serious long term consequences. AGI or Artificial General Intelligence. This is when robots become capable of being human (a.k.a. West World). Scientists like Alan Turing and John McCarthy envisioned this 70–80 years ago and we’re no closer to it now than we were then. IA or Intelligence Augmentation. A classic current example of this a search engine as it augments our memory and factual knowledge. Many of the machine learning applications today are in this domain. II or Intelligence Infrastructure. An example of this would be machine learning powered security systems that make use of a web of devices (infrastructure) to make human environments safer or more supportive. While we’re still in the early days, there’s plenty of investment in start-ups and fledgling companies directed here. It is important to be clear about these domains because a lot of mainstream discussion bandwidth is wasted in talking about the dangers of Artificial General Intelligence. That is a waste of time. Instead, our discussions should center around IA and II. We’ve made plenty of progress using techniques like Deep Learning. And, while both extend human capabilities, they also automate tasks that currently employ large groups of humans in the near term. 2. Are we conscious about the possible dark side of AI — specifically the use of artificial intelligence for surveillance? And surveillance may feel Orwellian — a sensitive matter now that people have begun to question how much Facebook and other tech giants know about their private lives. Companies are starting to monitor how much time employees spend on breaks. Veriato, a software firm, goes so far as to track and log every keystroke employees make on their computers in order to gauge how committed they are to their company. Firms can use AI to sift through not just employees’ professional communications but their social-media profiles, too. The clue is in Slack’s name, which stands for “searchable log of all conversation and knowledge”. The good news is that most of the preceding portions of the article talked about the benefits of algorithms in the workplace — fairer pay rises and promotions, improve productivity and so on. It will be on us to strike a good balance. 3. Are we designing the right social support systems to be able to prepare us? 80% of Swedes express positive views about robots and artificial intelligence versus 72% of Americans who declared themselves “worried” per a Pew Research survey. The challenge, of course, is taxation. Taxes are ~60% in Sweden and are a key part of the social contract. While the thought of ~60% taxes in the US would be morally repulsive, it is unclear how long we’ll be able to sustain the current reality. German Economist Heiner Flassbeck had a powerful graph showing the declining share of national wealth in rich countries (except Norway). National wealth in the US and UK is now negative. Low public wealth limits the government’s ability to regulate the economy, redistribute income and mitigate rising inequality. Regardless of Artificial intelligence, income inequality has been rising everywhere. If AI is expected to further increase the level of inequality, we’ll need to double down on the discussion on social support systems. For the record, I’m not optimistic that this will happen. Our ability to prepare for changes before they hurt us is poor (see: climate change). But, I’m hopeful that we can begin by changing how we approach conversations around AI. Maybe next time we hear a conversation about sentient machines, we’ll put a stop to the conversation and focus it on the actual issues like Orwellian uses of data and investing in social support systems to counter inequality. Maybe that, in turn, will mean thoughtful uses of AI in the the organizations we’re part of. Scott de Martinville, a French printer, began taking a hobbyist’s interest in the physics and anatomy related to sound. Since the 1500s, scientists had concluded that sound waves travel via the air and also travel four times faster via water. They had also figured out the anatomy of the ear and how it “received” sound. 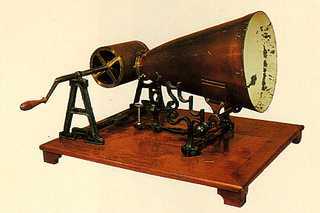 As stenographers were the best transcribers of sound, Scott created a device called the “Phonautograph” in 1857 that transcribed sound into sound waves. He had sought to automate stenography and expected to create a new language around interpreting sound waves. This didn’t work. However, Thomas Alva Edison went on to invent the phonograph which he expected would be used to send audio letters. Then, Graham Bell invented the telephone – which he thought would be used to distribute live music. They had it in reverse! Thus, phones brought us closer. The first international line between the US and Europe in the 1950s could just handle 24 simultaneous international calls. Telephones popularized “hello” and switchboards employed women professionally. Phones also gave us Bell Labs – an organization that created nearly every major technology – radio, television, microprocessors, fiber optics, cell phones, computers. More on Bell Labs next week. In 1906, Lee De Forest invented the first amplifier. Until amplifiers were discovered, performers relied on the acoustics of a given space to amplify their voices. Opera artists were expert proponents of this performance genre. One of the more powerful uses of amplifiers was a political rally. Suddenly, a powerful speaker could command the attention of thousands of people, live. Every great technology has seen uses that are good and evil – the amplifier was no different. On the one hand, amplifiers were a critical aide in Adolf Hitler’s rise to power. And, on the other hand, they also helped Martin Luther King Jr. create change that enabled better lives for millions of African American in following generations. Similarly, all the technology around us can be used to make things better… or worse. As always, it is our choice. There are many ways to write “state of industry” posts. One approach is to project the future based on trends established this year. Another is to project the future based on the current strategies employed by the top industry players.. I did some version of that in 2014 and 2015. This year, I thought I’d focus on a different approach – go back to first principles and look at business models. This is an attempt to focus on things that are likely to matter most in my personal opinion. It’s not an exhaustive list. I’ve pointed to 10 posts at the end which, together, should add more context and analysis. I’ve spent a lot of time on context/foundation given how important it is to power meaningful discussion. I contend that there are four fundamental business models on the internet and, since we’re talking about money, lay them out in two axes – frequency of transaction (a proxy for customer loyalty) and payment model sophistication (pay per use is much more sophisticated than pay per unit). There are many, many customer acquisition models (e.g. freemium). However, all these models bring us back to these 4. One-shot purchases: This model is used by anyone who can or has sold stuff online. Thanks to the internet, we can go into business on the internet and sell anything to, pretty much, anyone. Subscriptions: Or something-as-a-service. Thanks to the flexibility and collaboration cloud based services provide, the internet has enabled more subscription businesses than ever before. In essence, it hasn’t “created” subscription businesses as often as converting previous “one shot purchases” to subscription businesses (think: Adobe’s conversion to Photoshop-as-a-service and Microsoft’s ongoing conversion to Office-as-a-service). Subscriptions used to exist before but the internet has turbo boosted them. Ads: Ads have always been a constant 1% of the GDP long before the internet. Ad money just goes where consumer attention goes. However, there was an old world marketing managers quote – “Half of our advertising budget is wasted. The problem is we don’t know which.” While this hasn’t been fully solved by the internet, the amount of data available means digital marketing measurement system is light years ahead of old world systems. Now, advertisers can pay per click or even per conversion.Typically ad businesses jump into this matrix from outside of it altogether. You rarely see a business based on “one stop shopping” become an ad business. Instead, we see social/consumer networks that focus on user growth (and no revenue) that hit critical mass that then morph into ad machines (think: Facebook, YouTube, Snapchat).And, ads are low on customer loyalty because advertisers aren’t loyal to the platform. They’ll go wherever customers spend time. Tax: The tax model focuses on earning money when your customer earns money. It is powerful because it is aligned to a customer’s revenue growth versus a growth in headcount (as in the case of most B2B subscription services). On the internet, tax is typically how platforms (think: App stores, AWS, Uber, AirBnB, PayPal, Kickstarter) make money. Everybody wants to become a platform because the tax model is very lucrative. But, it is also very hard to get critical mass as a tax based business and typically take vast amounts of funding, grit and luck. However, the internet changes the nature and scale of these models. And, in doing that, it completely disrupts existing businesses. Disruption. Every conversation about disruption calls for the customary nod to Prof Clay Christensen. Over the years, Prof Christensen replaced the term disruptive technology with disruptive innovation because he recognized that few technologies are intrinsically disruptive or sustaining in character; rather, it is the business model that the technology enables that creates the disruptive impact. Disruptive technologies, thus, are often novel combinations of existing off-the-shelf components. Just to make that point, let’s consider one industry that is currently being disrupted – retail. You walked into the retail outlet, bought something and walked out. Retailers strived for transactional loyalty, of course. So, retailer loyalty cards were important. Once you committed to a Sam’s Club membership, you were likely to make more of your purchases at WalMart. And, that mattered. However, proximity to your home mattered a LOT more. Retailers had limited shelf space. So, they typically had a few large companies across various categories that fought hard for that shelf space. These companies – P&G, Unilever, Kraft, Black & Decker, etc. – were very profitable. They, then, used these profits primarily to sponsor advertising which ensured customer demand and, then, guaranteed distribution at retail outlets all over. They guaranteed distribution at retail outlets by a series of extensive discount and rebate schemes (i.e. a channel strategy) that enabled them to pass some of those big profits to their important retailers. While these companies dictated terms with most retailers, important retailers like Wal Mart had the upper hand. In a world of scarcity, aisles at Wal Mart were scarce and critical to success. So, even if Iam’s had the best pet food product on the market, they needed access to that limited shelf space to reach the mass market. So, being acquired by P&G made a lot of sense. Isn’t it amazing how a discussion on traditional retail touches all industries that sold product (i.e. all consumer packaged goods) and traditional advertising? On the internet, retail is built on the assumptions of abundance. The dominant business models are subscriptions and tax. You have access to anything, anywhere. You could, literally, find the same item on many websites. In many cases, you could actually just by-pass the online retailer and buy straight from the creator. Subscriptions are not the only way to build a retail business, of course. There are multiple platforms that make money via the “tax” model. Etsy, eBay, and even Amazon, enable third party sellers to sell their wares. But, if you are a small business looking to sell on the internet, you can now leverage the power of subscriptions to sell to your customers. And, Dollar Shave Club, Birchbox, et al, have led the way in doing that. In a world of abundance, subscriptions is how modern retailers ensure your loyalty. Of course, selling music or razors or books on the internet is different from selling on the cloud. You don’t have to worry about all the crazy distribution costs. Everything can be much cheaper. Retail is still in the early stages of being disrupted. But, as Benedict Evans points out, it is only a matter of time. And, while retail is fundamentally about a customer buying something, the way it happens determines the economics of the whole process. And, the internet has changed how buying happens. Stay tuned. One shot purchases. Of the 4 internet business models, one shot purchases makes less waves because it is, by far, the least sought after model. This is the piece of the internet reserved for the small businesses who can just create their own little online store with tools from the likes of a Magento or Shopify. The goal, here, is to build a brand and figure out a way to build a subscription. There’s too much going on to trust that a customer will come back to you. Subscriptions. Subscriptions, once again, had a big year. Let’s go through a few of the big moves. LinkedIn was acquired by Microsoft in the biggest acquisition in tech history. A big move for Software-as-a-service. ~70+% of LinkedIn’s revenue is subscriptions. The competition for B2B messaging-as-a-service intensified. Microsoft and Facebook took on Slack and HipChat for the B2B messaging-as-a-service market. This is important because the eventual winner of this race could create a platform for Bots and make money as a “tax” off its bots – à la app store. The App store enabled app developers to charge via subscriptions. About time. There’s still a lot of work ahead for the app store to make this process easier. But, this was a start. Soap-as-a-service. The launch of Amazon Dash buttons beautifully illustrates why the tax and subscription models are the place to be. P&G would like you to get the “Tide” Amazon dash button so you don’t ever do a search for a competing product. And, Amazon loves it because they charge P&G a tax for every Tide satchel stored. SaaS investments (mostly B2B) are going very strong. Crunchbase data shows that global SaaS funding has gone from $1.5B in 2010 to $7B in 2015. Hundreds of start-ups are building interesting, viable B2C subscription businesses – something-in-a-box. Just check this list of 70+ start-ups that all sell something-in-a-box. Wines, food, fashion – you name it and it is there. Facebook and Google continued to grow at ridiculous rates. Facebook and Google have been taking in most of the ad growth and conquering the very lucrative mobile display ads and search ads respectively. Facebook had all sorts of measurement issues. This led to a call for better 3rd party verification of metrics. Or, maybe another ads behemoth that can challenge Facebook to keep them honest. Non social media publishers were frustrated at only seeing a small percentage of ads revenue. A lot of the money in the ad space is in the “tax” business model – all of ad tech is effectively a tax. All this results in large publishers growing frustrated about only seeing a small percentage of ads revenue on their site. Internet TV took on real TV. Netflix and Amazon Prime Video are among the top 6 global content creators. YouTube, Facebook and Snapchat video all went after TV budgets as part of the ever expanding digital pie. The more people transfer their TV viewing time to the internet, the quicker this shift will happen. Everybody who wants to be a platform should learn from Amazon. They continue to show us how the tax model is done. AWS, Amazon Fulfilment service, Kindle are all great examples of this business model. There are many ways Amazon could do more of this – could there be a delivery-by-Amazon tax service (feat: drones) coming in the future? And, Alexa is clearly headed to be a platform tax in our homes. Stripe becoming a powerful tax business. All of payments is built on the tax business model. So, Stripe’s growth as a payment provider is significant this year (worth $9B now). Stripe added an innovative customer acquisition model with “Stripe Atlas.” For a fee, Stripe will help you incorporate your company in the US (all of us can be global one-shot purchase or subscription retailers, of course). And, of course, Stripe will automatically become the payment tax for your business. Brilliant. The race to become the platform of everything transportation related intensified. Uber pulled out of China. Lots of investment in Asia with companies like Didi, Ola and Grab. The action will continue. AirBnB had a challenging year – even with tremendous growth. AirBnB moved traditional hotel stays (largely one shot purchases) into a tax model – similar to Uber. And, similar to Uber, they’re trying to do a lot more than what they started with – flight bookings, travel planning, etc. However, there’s a lot of regulation against being the one global platform for rooms. And, AirBnB has been fighting that. Then, of course, there are all the issues with discrimination on the platform. Slack and Facebook trying to be tax platforms a la WeChat. Their play – bots. III. Explore what we might see in 2017 and beyond – with a lens on the trends everyone talks about. I am no prediction expert. But, I thought we’d touch on 4 interesting emerging technologies and what I think their dominant business models would be. For existing businesses, I think of Artificial Intelligence as a loyalty creator. I think deep learning will help existing technology giants deeper their connection with customers. It is hard not to bet on the giants (e.g. Amazon, Microsoft and Google) thanks to the massive amounts of data that powers their efforts. This is happening already. But, that said, I also expect many entrepreneurs leverage open source libraries like TensorFlow to create interesting implementations in niche fields (examples here) that the big companies won’t bother going after. We should either see some very high value start ups acquired by the giants and a potential giant-of-the-future emerge by building an extremely sticky product for a small niche and, then, gradually expanding. And, I expect these to be subscription businesses. I think it is unlikely we’re going to see a tax based platform given the giants’ moves to open source AI. Related note on self driving cars – could the future of cars be a shift from one shot purchases to subscriptions? Since disruption lies in business models, subscriptions may be the future of car ownership. In a world with rented self driving cars, maybe we’re looking at a future where we pay company X a fixed amount for unlimited use in the year? Augmented reality/Virtual reality. There are lots of options in play here. Snapchat has taken a stab at augmented reality through their glasses. That suggests AR/VR could be an interesting play for consumer attention and, potentially, monetization via ads. This isn’t hard to imagine – you are in your virtual Facebook/Pokemon Go world and there are billboards everywhere with ads for you to look at. However, I think there’s potentially a few subscription businesses in AR/VR. Think: $1000 a year for travel subscriptions (spend time in your dream locations) or $500 a year for gaming tournaments (play X virtual games with your global team). Finally, we could envision “tax” based monetization as well. An AR/VR company could help you buy clothes that fit a virtual you and charge retailers per use (perhaps a more advanced version of LikeaGlove?). The Internet of Things. I think a successful implementation of internet-of-things is going to result in 2-3 massive platforms who make their money as a tax. We need the equivalent of the iPhone and Android ecosystems for our toasters. The road to that sort of standardization isn’t really clear. But, if and when that happens, I think tax will be the way to go. And, if I had to bet on a company to do this, I’d bet on Amazon. What if private label Amazon toasters could connect to the internet and be controlled by Alexa? Related and very interesting, what if an embedded chip in your Tide packet could send a signal to your Amazon Dash button to put a Tide refill packet in your cart? Bitcoin and Blockchain. Bitcoin has had its best year yet. I think Bitcoin, a digital currency with near zero transaction costs, will make the implementation of “pay-per-use” even more prevalent. But, it will also accelerate the – everyone is a retailer on the internet phenomenon. One reason that shift isn’t happening fast enough now is because of cross-border currency restrictions. Just imagine what happens when all those something-in-a-box subscription businesses have easy access to a global market. Another example – if micro-payments become real easy, could we pay per article read? Then again, if this cross border stuff happens, there will likely be new regulation hurdles. The underlying Blockchain technology commoditizes trust and identity. I don’t understand the full implications of what online communities built on Bitcoin would be. But, as it is decentralized technology, a blockchain based Facebook will likely not see ad profits accrue to a comparatively tiny group of folk as they do today. Potentially very disruptive. But, my sense is that we’re still 4-5 years from seeing this playout. Also, blockchain tokens are a very interesting implementation of the tax model. Conclusion: There is a lot going on in tech and it is hard to really understand going on by following the news. A simpler, and yet effective, approach is to create mental models that help us make sense of all of this. One such approach is to look at the core 4 business models. At the end of the day, every promising technology has to prove its worth to survive. And, thinking about how emerging technology could change existing business models can be a powerful way to think about the future. At any rate, that’s how disruption is done. 10 interesting posts in case you want to dig deeper. We went down to a physical retail store to buy stuff for the home the other day. Right then, I realized how much we missed the Amazon experience. We missed two aspects in particular. 1. Reviews. I felt lost as I looked at products in the aisle. Were these the ones that came highly recommended? On what basis were they on the aisle? First, reviews and unlimited selection make the Amazon experience vastly much superior to most physical retail stores. I could immediately see a future application for augmented reality. I would imagine us wearing AR glasses to see reviews superposed on top off products in physical retail stores. We’d be able to instantly compare attributes and prices across retailers as well. Pushing this further, I’d imagine retailers would already know what I intend to buy by having their staff wear AR glasses of their own. After all, I was probably logged into their website when I was searching. They’d be able to help me as soon as they saw me walk in. Second, hybrid approaches often tend to be powerful. Maybe retailers could do better with having computers onsite that would help us browse their online inventory. At least, they could convert our intent to a sale by helping us make a purchase and have it delivered to our homes rather than have us go back and order it on Amazon. On the other hand, Amazon retail stores would be very helpful. They could just have all their best selling merchandise in one place. Finally, it is impossible to roll technology back. Such experiences repeatedly underline how naive discussions around bringing jobs back to “x country” are. The Amazon experience is better for customers with far lesser people employed per dollar of revenue. Even the folks who are employed in their warehouses are slowly being replaced by robots with a few human supervisors. Technology innovation is going to keep moving forward. It is up to us to keep pace with it.